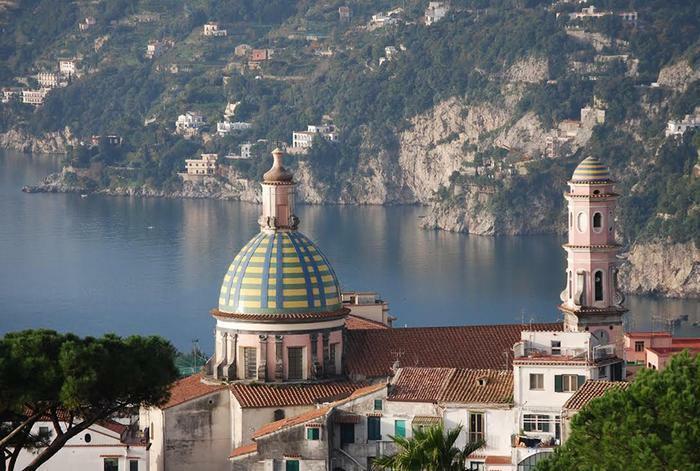 What’s it like to travel the beautiful Amalfi Coast? Exhilarating and thrilling are words that come to mind. Located along the southern coast of Italy, SS 163 Amalfitana connects the towns of Sorrento to Salerno with hairpin turns and narrow lanes that zigzag around the cliffs, with scant safety protection on the coastal side. The homes and churches appear to be carved into the hillside with a picture-perfect landscape dotted with neat gardens and umbrella pines. The views of the sea lapping at jagged boulders and sandy beaches make each corner irresistible for a photo stop. As we began our recent tour, our guide, Marcello, warns that traffic signs in Italy are “suggestions.” Marcello, a Sorrento native, makes us feel safe, unlike an earlier visit when we took the Sita (local) bus. Our young bus driver whipped around those tight turns, seemingly on two wheels. On our return trip, I was relieved to see we had an older bus driver, foolishly thinking our ride would be safer. His driving was even riskier and I prayed the entire way from Positano to Sorrento. Marcello believes in showing his “guests” the unspoiled Amalfi Coast, avoiding the more touristy towns of Amalfi and Positano. We began our tour in Vietri sul Mare, situated at the southern end of the coast and famous worldwide for its handcrafted ceramics. The focal point of the town is the Church of San Giovanni Battista (St. John the Baptist) with a late-Renaissance façade and an elegant dome covered in majolica. We crossed through picturesque villages with nary a souvenir shop, tour bus, or gelateria in sight. Along the way we continued to spy beautiful churches, charming homes, villagers going about their daily lives, local markets bursting with colorful produce, and just gorgeous coastline. The highlight of our day was what Marcello calls “a memorable Italian experience.” He took us high in the mountains, along windy one-lane roads, to the scenic medieval village of Pantone to “Cucina Tipica della Nonna,” a family trattoria. We sat on a covered patio with a scenic view of terraced gardens nestled in the valley overlooking the bay. The trattoria is known to use the freshest ingredients, cultivated by self-sufficient local farmers, just like farmers have done for over 100 years. Our fabulous feast began with five different appetizers, including homemade pizza, grilled vegetables, fried cheeses, tomatoes with Mozarella buffalo, and bruschetta. The main course followed with three homemade pasta dishes, and then the grand finale – three delectable desserts with a serving of each. Our last stop of the day was Stabiae, a seaside resort town just 9.9 miles from Mount Vesuvius, destroyed by the same volcanic eruption that devastated Pompeii in 79AD. I had heard Italy was built on ruins, but to see it firsthand was amazing. The villas are located under a farm, so parts of the old buildings were unable to be excavated without causing damage to the existing buildings. There are parts of the villas that they are unable to excavate as it would damage the farm’s buildings. We walked through what remains of the villas that were once graced with elaborate frescoes. A few remain, but many have been removed and relocated to the archaeological museum in Naples. Unlike Pompeii, this site is not well known, and it felt as if we had it to ourselves. A day with Marcello is a day of authenticity. He has shared the history, culture, and people that make up his heritage. A day well spent.